cifaljeju > Sus. Tourism (Past workshop info) > 2016 March 21-24: "Sustainable Tourism: Regional Tourism Development and MICE in Asia and the Pacific Region"
"Sustainable Tourism: Regional Tourism Development and MICE in Asia and the Pacific Region"
There have been literatures that tourism industry would be a drive for economic development. Countries have witnessed the role of tourism in Europe as a drive for economic progress as well as the source of economic recovery. As the number of international tourist arrivals worldwide has been steadily increased reaching 1,130 million in 2014, it has occupied 9% of global GDP, creating one in every 11 jobs worldwide . Particularly, Asia and the Pacific region showed the strongest growth in tourism population, welcoming 263 million international tourists in 2014. The region’s major destinations are expected to continue the firm growth by 5% average and the increasing trend also applies to sub-regions such as South East Asia . In this sense, with people’s understanding of its positive role in economic development, regional tourism within developing countries has been a growing phenomenon (Ghimire, 2001). Regional tourism which focuses a ‘region’ rather than a ‘nation’ has been regarded as an effective method to achieve sustainable development and deal with even the negative consequences and problems socially and environmentally emerged. As there are various stakeholders in a region, identifying and involving them are critical to make a plan sustainable. Also, including the trend of tourism which cherishes nature, culture and people has to be considered when the developers communicate with the diverse sectors of a society. Therefore, in many ways, regional development goes along with SDGs initiatives that value the mediation of conflicting interests of the groups involved. 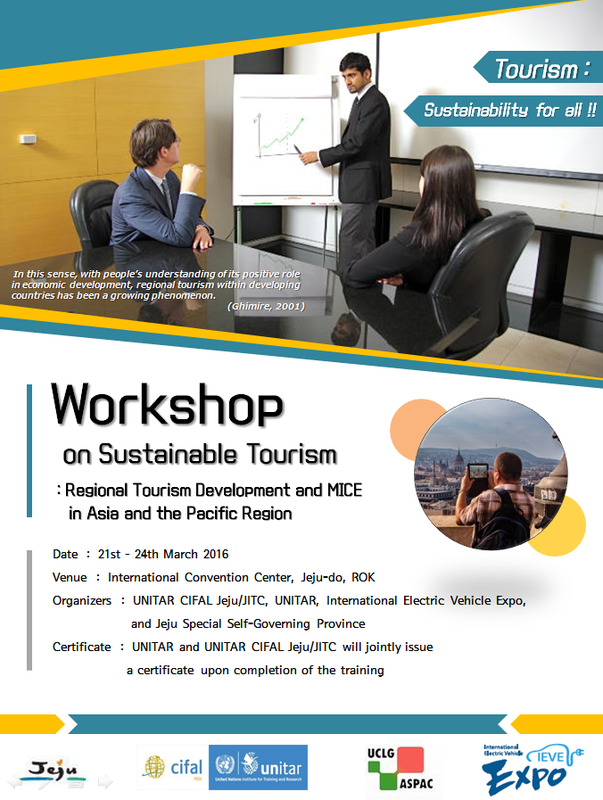 For this, this workshop will offer some best practices of sustainable regional tourism that can be generally applied to Asian and the Pacific region. There will be a session to discuss some policies in practice in line with SDGs that could provide some inspirations. Also, as one option to operate sustainable tourism, MICE tourism will be presented as a special addition and discussed in relation to its opportunities and challenges. The session will be arranged as a joint session with International Electric Vehicle Expo at International Convention Center, Jeju where the participants would experience the live voices and the real look of MICE tourism. In the end, the workshop will help local actors effectively develop relevant policies to conserve and promote their regional advantages for the social, environmental and economic benefits. - Provide an opportunity for local governments and cities in the Asia-Pacific region to exchange their tourism policies and best practices throughout city-to-city cooperation. - Promote a learning atmosphere between cities and establish a strong network that they can utilize after the workshop. - Offer a venue of knowledge transfer and discussion and inspire a healthy motivation to participants for implementing sustainable tourism policies in practice. - Utilize the lessons learned from the cases of tourism policy implementation in the Asia-Pacific region and internationally for their action plans. - Have basic understanding of MICE tourism and deepen the ideas of sustainable practices for regional/city/local development through local people’s participation. - Prioritize actions, targets, indicators and measures of progress to optimize the positive impacts of the regional tourism policy. - Describe methodology and a checklist needed for policy development considering both challenges and advantages of their region. - Coordinate partnerships to effectively promote the benefits of sustainable tourism policies with private sectors and civil society. ** The workshop will be jointly arranged with International Electric Vehicle Expo (IEVE). There will be many other events such as conferences and exhibitions. CIFAL Jeju encourages participants to experience MICE tourism atmosphere as the workshop will take place in International Convention Center where IEVE is held. - Summit necessary documents on time, i.e., application forms etc. - Complete and submit pre-training assignment, i.e., case study description etc.